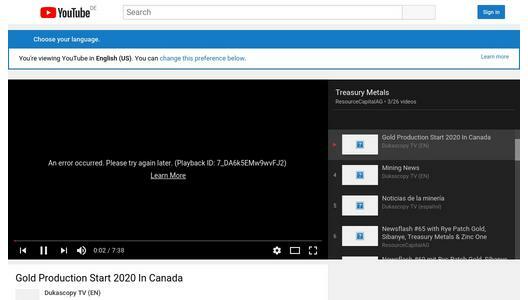 Treasury Metals Inc. (TSX: TML) (OTCQX: TSRMF) (the “Company” - https://www.youtube.com/watch?v=XxDAi5JFA1Q&index=2&list=PLBpDlKjdv3yry8w88yLZze1HW6r33zYSb&t=2s) is providing additional information further to its 2017 year-end financial statements regarding notification by the Canada Revenue Agency (the “CRA”) of its determination in respect of the flow-through spending audit (the “Audit”) commenced by the CRA in December 2016 regarding certain expenditures incurred by the Company in the years 2012, 2013, and 2014 that were characterized by the Company as “Canadian Exploration Expenses” (“CEE”) for purposes of the Income Tax Act (Canada). Treasury Metals is a gold focused exploration and development company with assets in Ontario, Canada and is listed on the TSX under the symbol "TML". Treasury Metals Inc.'s 100% owned Goliath Gold Project in northwestern Ontario is slated to become one of Canada's next producing gold mines. With first-rate infrastructure currently in place and gold mineralization extending to surface, Treasury Metals plans on the initial development of an open pit gold mine to feed a 2,500 tonne per day processing plant with subsequent underground operations in the latter years of the mine life. Treasury Metals is currently in the mine permit process on the Goliath Gold Project.